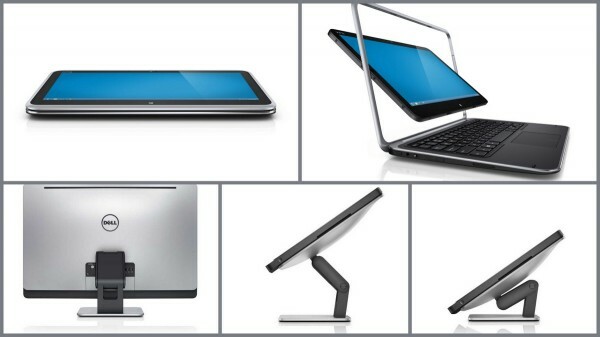 Dell has in recent years launched the whole series of laptops and with the XPS joined the other producers who are, more or less successfully, tried to connect ultra laptops and tablets. Dell XPS 12 Duo is a very interesting hybrid of ultrabook and tablet. At first glance, nothing reveals that behind the simple and minimalist design is hiding a powerful device. The Dell have thought of everything, and the Dell XPS 12 Duo comes in an elegant box that attracts attention and whose interior is upholstered in plush to prevent any damage to the device. Dell XPS 12 Duo is made of coated aluminum frame with carbon fiber which makes it very lightweight, yet durable. The hardest part of the casing is a screen that is coated with Corning Gorilla Glass. The part below the keyboard, on which we generally rely hands is covered with magnesium, which gives a pleasant impression. It weighs just over 3 pounds and it is suitable for everything.. The design is very minimalist. On one side are only two USB 3.0 slots, one 20-pin mini-display port and a slot for headphones, while on the other are placed slot charger, power switch button, a button for locking the rotation of the screen in tablet mode, and, interestingly, button for volume control. Switching from Ultrabook to a tablet is very simple. It is enough to just gently press the upper corners of the screen, and rotate it for 180 degrees within an aluminum frame. If you leave it in the raised position, you’ll get an interesting device for presentations because the system will automatically rotate the image. If you put the lid to the end the device turns into a tablet. Gorilla Glass does a great job because despite its frequent use we have not noticed any fingerprints on the screen. Although it is designed to control with the fingers, works just as well and when you take stylus into the hands. The screen is 12.5-inch (31.7 cm) Full HD (resolution 1920 x 1080 pixels) multi touch with integrated camera of 1.3 megapixels and the Windows 8. The camera provides a decent picture in well-lit areas, while in low-light it’s little harder to make out the object in the image. The screen is very vivid and with clear colors, which is especially visible in image processing and viewing multimedia. Even in very bright sunlight, it was possible to see what is happening on the screen, especially if bright colors dominate, such as is the case when writing a document. The keyboard, although plastic is very pleasant to work with. The keys are slightly curved, large enough for smooth typing and for a long time, and night owls will especially appreciate the fact that the keyboard has back-light. The touch pad is large and comfortable to use, and supports management with gestures. A device we get comes with a preinstalled operating system Windows 8. Powered by a quad-core Intel Core i7 2.0 GHz, which in combination with Intel Rapid Start system allows you to raise the windows in about ten seconds. There is also a version with dual-core Intel Core i5 for less demanding users. Dell XPS 12 Duo comes with 8 GB of RAM and a 256 GB SSD hard drive and Rapid storage system for quick storage. Dell has with it and threw its backup and recovery so users can at any time make a backup copy of important documents. As the device does not have the ability of LAN connecting, to connect to the Internet is using Wi-Fi and Bluetooth 4.0 technology. Speakers are almost unnoticeable, located on the side and in the first moment we replace them for a card reader. But although they seem small, they are strong enough for comfortable listening in noisy environments. Like other ultrabooks neither Dell XPS 12 Duo doesn’t have optical drive, which, combined with only two USB ports to individual users can be problematic. Lithium-ion battery, which can not be separated from the computer, lasts between four and seven hours, depending on what you are doing on the computer. To us, along with moderate web browsing, sending e-mail messages and undemanding operation lasted about five hours. When we include multimedia, time has fallen to about four hours. When we include multimedia, time has fallen to about four hours. The 12.5-inch Dell XPS 12 Duo is still a bit too big for a tablet. It takes some of use to find the most comfortable position for holding and extend the use was quite hard because of its weight. Also, the Windows system made some troubles to us while typing on the virtual keyboard because at some point they simply disappeared and to go back we took a few steps more than we wanted. However, due to the size of the screen, and the keyboard is large enough to be comfortable while typing long email or document. We concluded that the Dell XPS 12 Duo is much more comfortable to work as ultrabook, and its rotating screen is best expressed when you need to do a presentation or show someone what you’re doing on the screen without turning entire computer.